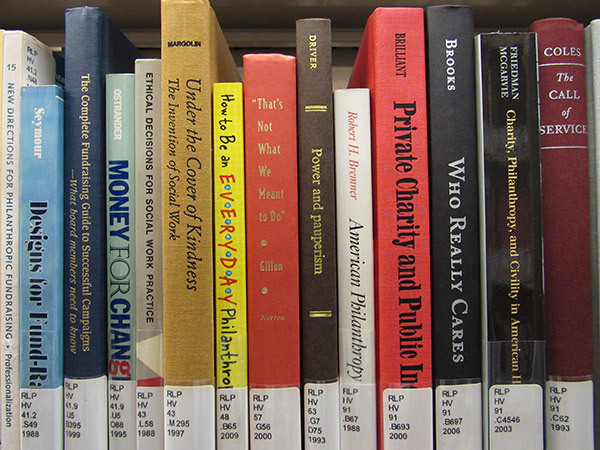 What do you read for philanthropy? Just asking what you read sounds as archaic as all the paper that carries the dramatic flow in the movie The Post. Whether it’s done on a broadsheet or a smartphone, reading is how we do our daily work and how we understand what’s happening. What we read is a telling reflection of what we think we are doing when we say we are engaging in philanthropy. I know that too much of what I read is ephemeral and contingent on fleeting networks. Taking more care in choosing what I read and sharing it with others will improve what I know and what I do, which is why I’m asking the question. A very different approach to academe was in evidence when we recently hosted Larry Kramer, the president of the foundation, whose talk on the polarization in our civic life reflected a career of engaging with serious legal, historical and social scientific texts. The reading he has done with his team resulted in the strategy of the Madison Initiative, a thoughtfully designed, long-term effort to repair our civic institutions. To top it all off, the most common question Larry asked our students and faculty was what books they were reading. Larry Kramer is not the only prominent philanthropist who is serious about books. Bill Gates shares notes on his voracious reading through his well-known blog. And you will also find a bevy of reports online claiming that prominent wealthy people read more, and more seriously, than those with less material wealth. So if you want to get ahead, read more and read seriously. You get to decide what getting ahead means for you. Reading does take commitment. As video takes up more of our bandwidth, both online and between our ears, there is no substitute for careful, considered reading to gain new or deeper understanding. Serious research and scholarship are still primarily conveyed through the written word. The kinds of peer validation that the Hewlett report describes is different from the peer review that is at the foundation of the research enterprise that builds knowledge over time, moving civilization forward. The former is about reactions in the moment to the issues we face; the latter relies on a more careful written formulation of a claim that is then read at a distance by others who have good knowledge of the issues and the methods proposed to address them. This careful reading asks about close and distant precedents, how did we get here, who else knows about this issue, and how confident we are about our understanding, all before we propose ways of moving forward. This also benefits future actors as the findings are published and findable and part of an ongoing conversation. Of course, not all issues lend themselves to the kind of deliberative approach that involves careful reading, but it should also not be the case that foundation personnel remain unaware of the research that defines their industry and of the writing that has been considering the impact of generosity throughout history. Generosity is a fundamental part of the human condition, which is why our school was grounded in the liberal arts. We read about voluntary action for the public good and inquire about it from the full range of perspectives on human and social relations. The promise of a liberal arts approach is precisely to free ourselves from the tyranny of the immediate and to read the context of our lives for ourselves and to craft our own way forward. Though we value individual liberty as a condition and a destination of this kind of education, we do not achieve it in isolation. We share what we read and do so gladly, be it in the classroom or a book club. But I as an academic should not be defending the liberal arts that I espouse, as Hunter Rawlings elegantly declares. Instead, it is those outside the university whose lives have been changed by engaging in a liberal arts education who should speak to what it enables. Rawlings mentions liberation, irreverence, pleasure, provocation, and courage as key benefits of a liberal arts education. Reading is one of the main activities in a liberal arts education. So if your job or your life could use more of any of Rawlings’s elements, perhaps you should pick up a new book. Two books we read in the basic general education course on philanthropy on our campus, Giving and Volunteering in America, are a compilation of historical readings and an inspiring story of redemptive transformation through generosity. On my night stand is Putting Wealth to Work as we will be hosting Joel Fleishman, professor of law and public policy sciences at Duke University School of Law, as our fourth 30th Anniversary Speaker on March 22. Finally, reading for philanthropy does not mean only reading texts that explicitly mention philanthropy. The creative spirit that examines the world or imagines it anew through fiction is a reflection of the generosity of so many men and women who have given of themselves and their mind’s work. Any reading that gives us a better perspective on the world and the people in it is a gift that we should share. So read generously with a commitment to fully appreciate the author’s perspective as it was intended to be understood, but also be generous in sharing what you have gained through your reading. Indeed, this is the way we read when we read happily and with good results. In reading we need some time to ourselves, but not only. The liberty to read and share what we have read is deeply enshrined in our civic culture. The generosity that we engage in when sharing what we read is just as deeply important. We just haven’t read about it as much. So with my prized liberty, allow me to call on your generosity and ask, what do you read for philanthropy? Let me know at ampasic@iupui.edu. Since childhood, Julia Kathary, M.A. ’08, has been involved in clubs and social services that help people. “I really enjoyed giving back and making the community better. My family struggled for a long time, which was hard,” Kathary, executive director of Coburn Place Safe Haven, says. While employed at an Indianapolis domestic violence shelter, Kathary learned about the executive master’s option in the philanthropic studies program, where she could work full-time while attending online and in-person classes part-time, completing her degree in about three and a half years. “It just clicked in my soul. I knew that’s what I wanted to do. I wanted to have that skillset and that education on how to build sustainability,” she says. 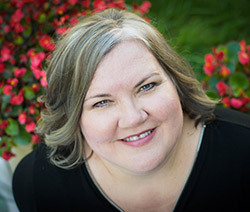 Toward the end of the program, Kathary started her own consulting business, working mostly with domestic violence or sexual assault organizations. She focused on community-wide planning and collaborative solutions for those tough issues. “I wouldn’t have been able to do that without what I learned from the program,” she says. “When the executive director position at Coburn Place came open, it was the merging of my passion, my experience, and my academic learning. Now, I’m using the full range of what I learned in school, including mission and organizational sustainability, budget and fiscal management, board development, and other resources, in my work at Coburn Place. Even years later, Kathary remembers influential professors. Kathary's advice for current philanthropic studies students? Gaining practical experience in the nonprofit sector. How effective is our charitable giving? Is it efficient? Does it even make a difference anymore? 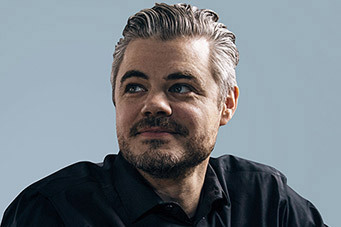 Scott Harrison, founder and CEO of charity: water, will discuss the 21st century face of charity and “reinventing charity” March 8 when he gives the Thomas H. Lake Lecture in Indianapolis presented by Lake Institute on Faith & Giving. The first 750 people to register will receive a free copy of his upcoming book. The key to charitable giving today is connecting people to their passions. The days of passive giving are gone – donors want to know where their money is going and how it is used. Younger philanthropists, in particular, want a personal connection with the charities they support. In light of these changes, it’s important to ask: what is the future of faith, charity, and philanthropy? Harrison will share his story of rediscovering his lost faith that brought him face-to-face with the global water crisis. He will talk about how he is leveraging technology and innovation to reinvent charity and build America’s largest private funder of international water programming, and along the way, transforming the traditional form of charity. Three students have won competitions for scholarships that will fund travel to learn first-hand about a specific aspect of philanthropy and make a donation to a nonprofit of their choice. They were selected from among a group of students who each delivered presentations about their philanthropic passions and where they would like to go to learn more about them and provide service to others. Members of the Lilly Family School of Philanthropy’s Board of Visitors judged the competition. 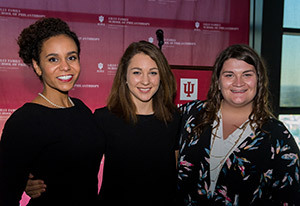 Undergraduates Rosie Tarlton and Elizabeth Williams received the David Nathan Meyerson Prize for Leadership and Giving, which will enable travel in the U.S.
Doctoral student Tiara Dungy, who received the Graham-Pelton Prize for International Service, will travel internationally to volunteer. Both scholarships complement students’ classroom experiences by allowing them to learn about and from organizations engaged in the daily work of philanthropy. Tarlton’s presentation focused on children’s health issues. Williams discussed how to help people living in poverty, and she intends to visit the Chalmers Center, a Georgia nonprofit addressing urban development, poverty alleviation, and economic growth. Dungy plans to go to a fishing village outside of Accra, Ghana, to work with a human rights organization that fights abusive child labor, or teach children in the same community. She will stay with a family and hopes to use the experience to guide research for her dissertation. We thank the generous donors of both prizes for making for making these student learning opportunities possible. 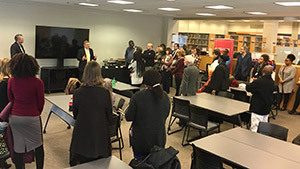 The Ford Foundation-funded ARNOVA-AROCSA NGO Leadership Transition Fellowship Program in Africa selected our school and the School of Public and Environmental Affairs at IUPUI as its inaugural hosts. Nine senior nongovernmental organization leaders from Southern and West Africa are spending the spring 2018 semester in Indianapolis engaging with both schools’ faculty and civically engaged Hoosiers. They’ll reflect on their careers as change makers, broaden networks, and prepare to transition to new careers as professors of practice in African universities. In their new positions, they will take on new teaching, research, and other leadership roles that will allow them to impart their lessons learned in the field to a new generation of philanthropic studies and nonprofit management students. Each fellow also will write a reflection on their work that will be compiled and published as a resource for emerging African civil society leaders. The Association for Research on Nonprofit Organizations and Voluntary Action (ARNOVA) and the Association for Research on Civil Society in Africa (AROCSA) bring together scholars and practitioners interested in advancing research on nonprofit, NGOs, philanthropy and civil society and strengthening professional practice in those fields.